The Luxury Residence in Paradise is a Puerto Vallarta hotel that offers well-equipped condo units in Nuevo Vallarta’s Paradise Village area. Found within very close proximity of the hotel are such things as a marina, a shopping center, the El Tigre Golf Course, and inviting beaches. Shuttle service is available for getting around the more immediate area, and guests who wish to venture off to places that are farther away can rely on local city buses or convenient water taxis. 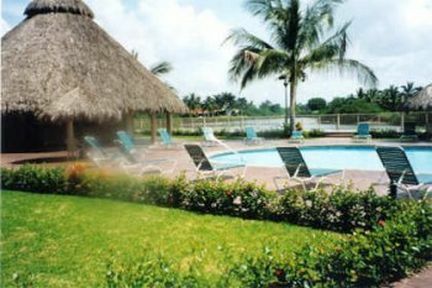 At the hotel itself, a community pool figures among the general facilities, and 24-hour security provides peace of mind. Each condo at the Luxury Residence in Paradise has everything that you would expect to find in a Puerto Vallarta vacation rental. This includes both kitchen and laundry facilities. A television and air conditioning are part of the amenity mix as well, and guests have ample room to stretch out. Also, while the word “luxury” is in the hotel’s name, the condo units at the Luxury Residence in Paradise are actually very affordable. They're not exactly the most luxurious condos around, but it is surely hard to beat the rates if you are trying to find self-catering accommodations in Puerto Vallarta.